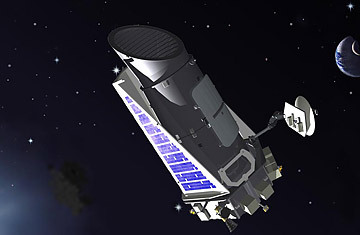 Astronomers have used the Kepler Space Telescope (seen in an artist's rendition, above) to locate likely planets orbiting stars beyond the sun. To date, the Kepler space telescope has found more than 1,200 likely planets orbiting stars beyond the sun  quite a haul for a satellite that's been flying for just over two years. The true prize Kepler is hunting for, of course, is not just any planet, but one that's a twin of Earth  about the size of our world, orbiting in a zone where the temperature range is like ours. All that would make it a prime place to look for life. Finding such a not-too-hot, not-too-cold world is probably just a matter of time, but even then, there will be one more factor to consider: how old the planet is. In the biology game, planetary age can be everything. If alien astronomers had discovered Earth when it was just a billion years old, the only life they'd be able to find would be the most primitive of microbes. If they waited another billion years, they'd see the effects of cyanobacteria pumping oxygen into the atmosphere. At about 4 billion, multicellular organisms would arise. And if the aliens wanted someone to talk to, they'd have to wait until Earth had been around for 4.6 billion years, when humans began communicating with radio signals. The same limitations are true for contemporary earthlings studying other worlds. Trying to determine the age of a planet directly is well-nigh impossible, particularly at the vast cosmic distances at which Kepler is forced to do its work. But there's a way around that problem, and it begins with the fact that all planets are about the same age as the star they orbit; if you know how old the parent sun is, therefore, you know the age of its litter of worlds. Here too, however, there are complications. First of all, the easiest stars to date directly are the most massive ones, like red giants, which change in both color and size as they get older. That's well and good, but we're not interested in red giants  at least when it comes to looking for Earth-like life. We're interested in smaller, yellow suns like ours. "Unfortunately," says Soren Meibom, an astronomer at the Harvard-Smithsonian Center for Astrophysics, "a star like the sun looks almost the same through most of its lifetime." The key word here is almost, and if you know what to look for, suns like ours do yield clues. For one thing, they tend to rotate more slowly as they get older. For another thing, young suns tend to have more sunspots than older ones do. Find a slow-spinning star with a fairly clear complexion and you've got a mature solar system that could harbor life. Such stars have to be relatively close to Earth for Kepler to resolve those kinds of details, and while they do exist, they take some sleuthing. What's more, current rate of spin is not a terribly good measure without knowing the original spin rate too. Our sun takes 27 days to complete one rotation. Is that a little slower than it used to move? A lot slower? Unless you have that second data bit you can't say much about our star's age. Meibom, at last, may have figured out a way around all of these problems. He's using Kepler data to do his age dating too, but he's not focusing on individual stars; instead he's looking at star clusters. They're common enough in the Milky Way (the constellation known as the Pleiades, or the Seven Sisters, is probably the most famous), and they form more or less all at once, out of huge interstellar clouds of gas and dust. By measuring the overall mix of colors and sizes in three clusters in the Kepler field of view, astronomers have nailed down their ages at 1 billion (for the cluster known as NGC 6811), 2.5 billion (NGC 6819) and 9 billion years (NGC 6791). That's just the first step, however. The second step involves going back to the spin rate. Meibom and his colleagues have used Kepler to check the rotational velocity of sunlike stars in NGC 6811. They clocked in at up to 11 days, which the scientists can now assume is pretty standard for a sun in a 1 billion-year-old cluster. Next they'll look at the 2.5 billion-year-old cluster, and the 9 billion comes after that. If it all goes as he expects, says Meibom, "we'll end up with a well-calibrated clock that tells us the ages of sunlike stars." That would include at least some sunlike stars that aren't part of clusters and that thus offer no other clues to their age, and that, in turn, would tell you the approximate age of any planet that orbits those stars. All that may be a convoluted way to determine something as simple as when a planet was born. But if it provides evidence that biology may have been born there too, it's surely worth the effort. See "Kepler Telescope Finds Swarm of New Worlds." Read about the first Earth-like planet found in space.